Sometimes a crate notion: Cristina Cantu Diaz's 'Triunfo del Trabajador' uses humble objects to create a monument to field labor. TWO CURRENT shows on South First Street make it easy for art fans to sample a lot of fresh ideas in a one-block trot. MACLA's second "Chicana/o Biennial" enticed a large number of self-identified contemporary Chicano artists with a no-fee juried structure. The participating artists come not just from the Bay Area but throughout California and the Southwest. A few doors away, the San Jose Institute of Contemporary Arts' annual "NextNew" exhibit allows established art faculty to hand-pick young artists they think worthy of the spotlight. Although MACLA's entries carry a more explicit political/social charge based on the stated theme of seeing art through "the lens of the Chicano experience," both exhibits offer free-ranging experiments in media and motive. At MACLA, Cristina Cantu Diaz's Triunfo del Trabajador asserts itself with wit anchored in weighty thought. 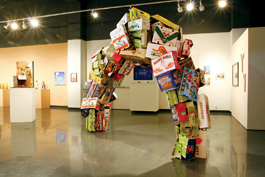 The artist has taken empty fruit and vegetable packing boxes and assembled them on an iron rebar support to erect an archway. The boxes jut and thrust like a string of faceted rock crystals. The brands and logos—Airdrome Oranges, Baby Doll Tomatoes, Dinosaur Brand Fruit—pop with the vividness of ads while the overall shape evokes a formal perfection. It effectively evokes all the migrant workers who picked the long-ago-eaten contents of these containers. This classical form commemorates their efforts as surely as if it were made of marble. Arches of a different kind lurk in the junglelike foliage of Alejandro Oliva's manipulated C-print MacDonalds From White Road. The familiar double-hump yellow logo, glimpsed through dense shrubbery, looks like an architectural ruin from a civilization that collapsed under the weight of its own ruinous consumerism. In a companion image—Gas Station From East Side San Jose—Oliva places a petrol pump in a thicket of wildflowers, as if Mother Nature finally got the last word on global warming. Nature also dominates in Jetro Martinez's oil-on-panel Sol Cactus, a large close-up of a cactus branch with two petal-thick red blossoms. This Southwest botanical icon is deracinated against an abstract background of interlocking circles done in gold leaf. Two intriguing cross-cultural entries point eastward. In Joaquín Alejandro Newman's ¿De dónde eres? (Where Are You From? ), an Asian woman and a Latina woman clad in traditional Japanese hairdos and kimonos meet in a street full of multilingual signs (English, Spanish and Japanese), beneath hanging strands of paper lanterns and Mexican papil picado banners. East also meets West in Ester Hernandez's wondrous Budalupe, a beautifully rendered version of the Virgin of Guadalupe in traditional starry-field cloak gesturing like the Buddha and kneeling on a pair of cow horns. I'm a secularist, but even I felt the peaceful power of two religious symbols embracing. Less successful are the three photographs of an artist known as emael, who appears trussed up and doused in flour. You have to read the gallery notes to learn that emael donned a hemp suit daily for several years in an extended performance-art exercise. A lot more documentation is needed to determine how effective the artist's project was on himself and those who encountered him. Nao Bustamante's video, A Story, is just as mystifying. The artist dismantles a small painting, removes the glass backing and runs her lips around the edge, appearing to cut herself. Blood (or maybe pigment) runs down the glass. A dog barks in the background. Quilt Guilt: Elisabeth Higgins O'Connor's fabric creature stares down all comers. At SJICA, the video and multimedia pieces suffer from some of the same lack of focus. Amy Sampson's three-part video loop uses low-tech computer tricks to evoke dream states that are supposed to be threatening. Pillows and rugs float around the head of sleeping woman. A kneeling woman watches another woman, seen from the legs down, pick up wigs one at a time until they proliferate like Tribbles. Later, some purple plush moose start dancing in space. I wasn't threatened, just puzzled. What would Freud think? In the back corner of the gallery, Lauren Lavitt's Ocean Box Series installation consists of some bedraggled fragments of cardboard decorated with poster-paint hieroglyphs, two photographs of said cardboard strewn about a rock beach and an underlit, shaky-cam video of the artist soaking cardboard in a pan of water and then dragging the cardboard through the ocean surf. These sodden parts do not fit together into even the comment on recycling hinted at by the wall label. Relying on found objects to more salient effect, Ali Dadger takes five front pages from sections of The New York Times and whites out most of the words and pictures, leaving behind traces of troubling images and bits of concrete poetry (in the opposite of the classic ransom-note technique). One dire news day features the faint palimpsest of a solider with the words "The Week for Killing the Other." This is media manipulation at a heightened level—breaking us out of the haze in which we sometimes scan bad news without really absorbing it. SJSU MFA grad Ema Harris-Sintamarian, a fiend with a fine-point pen, delivers three enormously knotty works, two in black and white, one in color. The black-and-white designs enclose fevered mazes constructed of every smaller no-exit corridors. They look like microscope slides of malignant cells full of broken DNA. Sintamarian's extra-large untitled, unframed colored-ink drawing features a house surmounted by blue clouds caught in a swirl of images—a cowboy, a hand, a soldier, a wheel—in various hierarchies of scale. This intricate epic rewards long, close attention with seemingly endless tributaries of meandering lines. I very much liked my encounter with Elisabeth Higgins O'Connor's pair of 6-foot-tall stuffed beings (maybe large pig rodents) fashioned from old, distressed quilts, comforters, bedding, shawls, afghans and other warm-wear flotsam. The figures, stiffened and arranged in aspects of arms-akimbo defiance and shoulder-slumped defeat, are inventive in the extreme. A blue-tinsel boa serves as a bootie for one foot; another foot is made out of a triangular pile of foam stuffing torn into small pieces. A dangling arm ends in an angry ball of flaying red twine. A trip to the artist's website reveals that she is busy creating a whole army of these menacing castoffs. In related fashion, Jennifer Brandon shows three life-size vertical photos of decaying mattresses floating on white, featureless backgrounds. From left to right, the cloth decomposes, revealing the faded cotton batting and rusty bedsprings underneath. Oriented vertically, the mattresses look like monumental plinths. Most intriguing of all are two DVD projections by Binta Ayofemi, a Stanford MFA grad. Talk about timing. Ayofemi's Untitled (after L'Eclisse) restages in color a famous scene of an estranged couple from Michelangelo Antonioni's black-and-white 1962 classic, Eclipse, a seminal text in Euro ennui. A table fan blows relentlessly; the man and woman stare into the distance; the camera scans the book spines on a shelf; news coverage of a disastrous fire plays on a video monitor. Ayofemi's couple is Asian, not Italian, but the essential power of Antonioni's compositions sustains this careful homage. Ayofemi plays the same trick with the infamous traffic wreck from Godard's Weekend. A nice simulacrum of Godard's typical shot of reflections on a woman's face passing across the windshield of a moving car is intercut with a pan across a linear arrangement of stills from Weekend showing a long line of smashed vehicles on a country road, while horn blasts pepper the soundtrack. Again the source is impeccable, and Ayofemi does it justice. I do hope, however, that the artist turns to making her own films rather than remaking the films of others. If she is not careful, she could end up classed with the kind of bad Antonioni parody of the same breakup scene contributed by friends of one jabbamom in a recent YouTube clip.